It is the first building to be clad in Corten steel in the region. The Wedge on Western is a retail center at 69th Street and Western Avenue in Sioux Falls, SD. 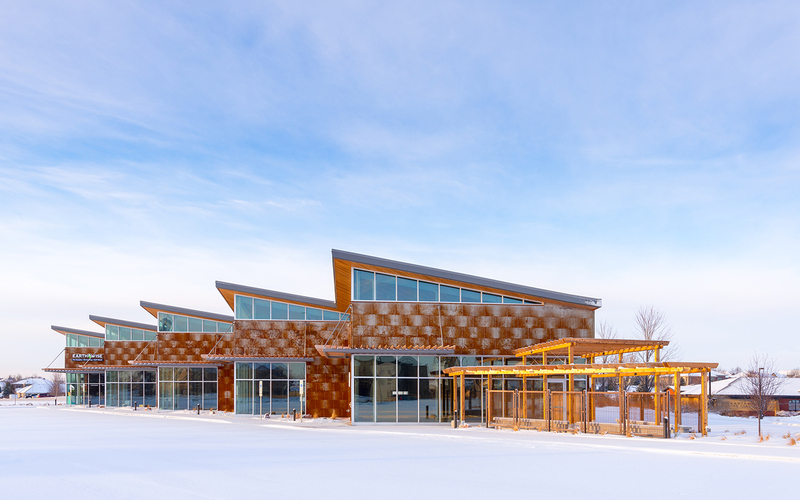 Koch Hazard Architects and building owner Steve Gratzfeld worked together to design a uniquely shaped retail center incorporating Corten steel, an unfamiliar façade material to the local strip mall language. It is the first building to be clad in Corten steel in the region, others are now following through experimentation with accents. The metal expresses a natural chemical reaction in real time and resists oxidation by developing an outer patina layer which protects the steel from subsequent corrosion. This panel system adds a weaved pattern to the façade and was overall, an affordable material. The 17,000 square foot project can be subdivided into suites starting at 1,600 square feet. The site is uniquely shaped by a natural gas line and electrical easement. The wedge-shaped building maximizes use of the site. Five corner storefronts create an undulating street presence, accented by a cedar canopy to provide shade over the east and south facing windows. Wood-structure canopies bookend the north and south patios. The Wedge on Western was completed in 2017. Koch Hazard Architects has been assisting clients in attaining their visions for over 57 years. The firm focuses its energies and expertise on architecture, planning and interior design. Koch Hazard has pioneered sustainable facility design in the state of South Dakota, designing the state’s first LEED Gold, LEED Platinum renovation and new building projects, along with 15 other projects at various levels of LEED certification. Over the past 20 years, Koch Hazard has won more than half of the state’s design awards granted annually by AIA South Dakota.